Last fall Connie and I decided we would get rid of the Coachmen Class C that I still had from my previous marriage. While the Coachmen had served me well, it was getting a bit long in the tooth and really didn’t meet our goals for the future. We spent the next several months visiting almost every RV dealer in the St. Louis area, walking through numerous new and pre-owned RVs, and trying to pick something that we both liked. Early on we decided that a fifth wheel best met our needs. In December we visited Camping World in Columbia, MO, and found a model that we both liked from the time we first saw it. 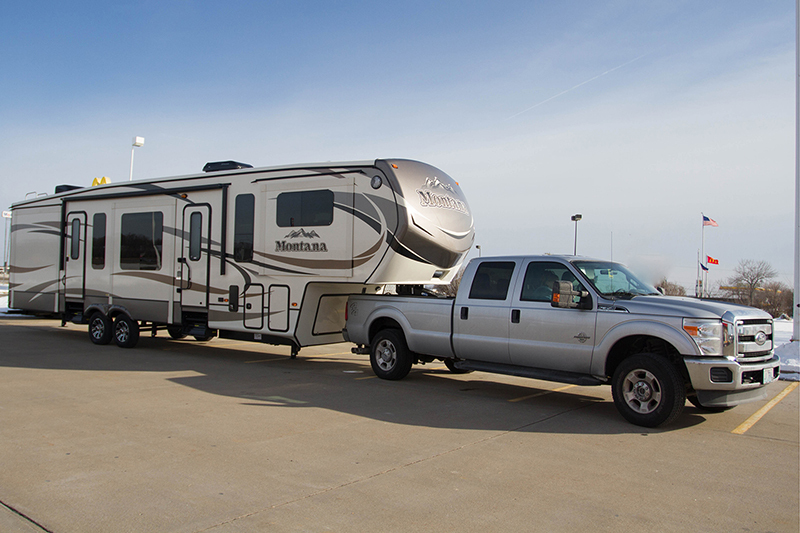 The Keystone Montana 3711FL is a six-slide out model with a front living room. After some negotiation, we sealed the deal and picked up the new trailer. Unfortunately the first outing was a bit of a disaster. Even before leaving Camping World there were problems with the furnace and backup camera which they agreed to fix. Because of the design of the kitchen cabinets and the slide outs, the first use resulted in two cabinet doors being torn from the cabinets and the slide out mechanism being damaged. As very unhappy customers we returned the trailer the next day and asked that it be replaced. We have to say that the entire Camping World team in Columbia were very responsive to our needs and after working with their headquarters and Keystone agreed to replace the trailer. Throughout the replacement process they were responsive to our questions and kept us informed about the progress. Early last week we got the call we had been waiting for – the new trailer had arrived and was ready for pickup. We lucked out and were able to go to Columbia this weekend (between winter storms), go through an extensive predelivery inspection, and bring the new Montana home. Camping World even installed additional child safety latches on the cabinets to prevent the type of incident we had with the first trailer (at no expense to us). I really can’t say enough good things about our experience with Camping World in Columbia. Got the new trailer home and in storage on Monday and we are now looking forward to our maiden camping trip.